Manchester United came into their match against Newcastle full of confidence after a 3-1 victory over Club Brugge in the Champions League play-offs, playing the same way against Newcastle. Problem was that Newcastle’s defence was in inspired form. United looked like they had a lot of ideas, but they couldn’t find the net and Newcastle almost made them pay for it. 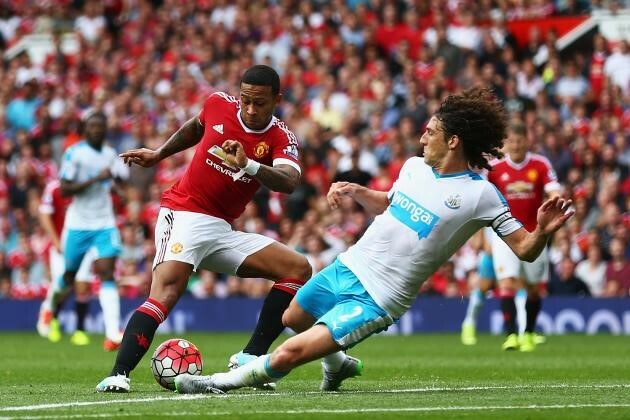 Tim Krul and Fabricio Coloccini were Newcastle’s best performers, stopping every United attack. However, this is still unacceptable for United. Louis Van Gaal praised the performance and said that he doesn’t need a new striker, but the calls for one are still going on. Chicharito showed a glimpse on why he should start, but still not enough and Rooney remained ineffective. It is a continuing trend for United as they always seem to have a problem in one position. Last season it was the defence and the seasons before that, the midfield had been a constant problem; and now the forwards department can’t supply the goals. We’re just days away from the transfer window closing and if United want a new striker, they need to act fast. And continuing from the last post, the latest player linked to Manchester United is so unbelievable that some of the fans immediately rejected it. Barcelona’s Neymar is now linked to United. Yes, you read that right. It is unfathomable on how this news got started. However, some news outlets picked up on it and started to report on the latest developments. Surprisingly, Barca manager Luis Enrique kept silent on the whole matter. Sadio Mane and Thomas Muller are also linked, but their respective clubs have ruled out a sale. Other players linked are Alexandre Pato and Dynamo Moscow’s Aleksandr Kokorin, who are cheaper alternatives and much more realistic targets. But can they actually help get the goals? Heck, will United actually get a new striker before the window closes? One of those forwards that United missed out made an instant impact at Chelsea. Pedro contributed in Chelsea’s first win of the season with a goal and an assist in a somewhat nervy win over West Brom. It was only nervy from the 54th minute onwards because Chelsea captain John Terry got sent off for being the last man to take down Salomon Rondon. Before that, Chelsea looked as they did for the first half of last season. Despite making it 2-3 thanks to James Morrison’s 2nd goal of the game, West Brom couldn’t find the equalizer. Jose Mourinho was happy with the team’s performance, especially Pedro, and with good reason too as he was Chelsea’s best player, troubling the West Brom defence for most of the game. You have to wonder what would’ve happened had Morrison converted his penalty when the scoreline was still goalless. There’s one question in everyone’s mind: Is there a team capable of stopping Manchester City? Everton so far is the closest to giving them a fight. Nonetheless, City took their chances. Aleksandar Kolarov and Samir Nasri scored to put City on top of the league. Sure it is only three games in, but the way City play their matches look the way a team of champions should play. It’s a goalkeeper again who kept City from scoring more. Tim Howard was able to keep out City’s other seven shots-on-target. But you have to remember, everyone has to do their job. Howard did his, but what about the rest of his team? And for this mini-segment, we look at how the promoted teams did on the weekend. Bournemouth is the biggest winner with an entertaining 4-3 victory away at West Ham thanks to a Callum Wilson hat-trick. Watford and Norwich could only play out 0-0 and 1-1 draws with Southampton and Stoke respectively. Bournemouth finally show what they can do after suffering two slim 1-0 defeats, but they have an in-form Leicester City visiting next. Norwich goes to Southampton as they look to continue their impressive away form under manager Alex Neil and poor old Watford is visiting a rampant Manchester City. Tags: Chelsea West Brom, manchester united, Neymar, Premier League. Bookmark the permalink.